Here are a couple of free DJ player for browser that you can use. Here they allow you to play and mix songs and use other features as well to make the final playback awesome. They simply take songs from you or import from SoundCloud and then you can use your DJ skills to play them. There are options to mix tracks, control the volume of individual song, change tempo, change BPM, CUE. loop audio, and many more others. Currently one of them supports playing 4 songs together and the other one can play two songs at the same time. Also, if you want to play a single song only then you can do that. There are plenty of free DJ software already there but if you want a free online tool for the same, then you will surely like the following online DJ players. Without creating an account, you can play your songs with most common DJ controls. And the way they mix songs is pretty awesome. You can even separately specify from which part, you want to play a song. You can change the speed of the currently playing tracks to make the overall mixing sound amazing. PlayDeck is one of the best free online DJ player that you can try. It runs directly in the browser and takes the songs from you. It lets you upload up to 4 songs at a time and then you are free to do whatever you want. Here it allows you to play all the songs by mixing them together. Or, you can also play the songs one at a time as well. There are options in it to configure some of the sound parameters like bass, treble, volume, frequency, playing speed, and some others. And to start using it, you don’t have to create an account or go through a sign up process. The below steps will guide you on how to use it. Step 1: Access PlayDeck from here and then upload the songs on it that you want to play. You can upload four songs at a time here and then you can play them in the way you want. You can either play them one after another or play them by mixing them. 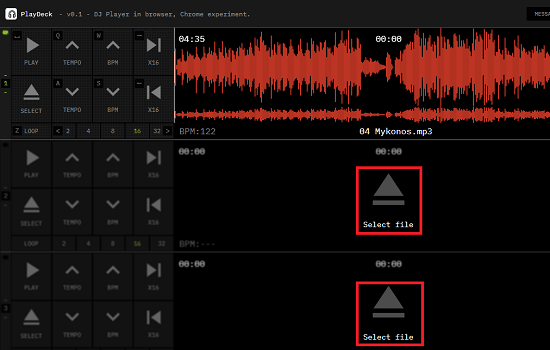 Step 2: When you are playing or mixing the songs you can control various parameters. There are different controls given all over the DJ player that you can use. You can control the volume of each song, change the playback positions, add a loop, fast forward the songs, change the mid, low, and high frequencies using the knob controls. Step 3: When the songs are playing, you can sit back and relax. You can either opt to play the songs individually or you can mix them all. And not just all the songs, but if you want to only mix specific songs then you can do that. That is how this online DJ player works. And you can anytime use it to play songs for yourself or your audience. The interface and controls are very simple to understand and use. Just upload songs and start playing them or mix them. However, some of the advanced control are still not there but it is still good for small parties or reunions, etc. scMixer is another free online DJ player that you can use. The difference between the above DJ player and this player is that here you cannot upload your songs to play or mix. But you can search songs in it and play them as it supports SoundCloud integration. It lets you search for tracks, albums, etc. It allows you to play or mix two songs at the same time. There are two decks on its interface. You can search a song and then push it to any deck you like. There are other controls on its interface that you can use to mix the songs or you can use them to control the other parameters like bass, treble, middle, frequency, and volume. 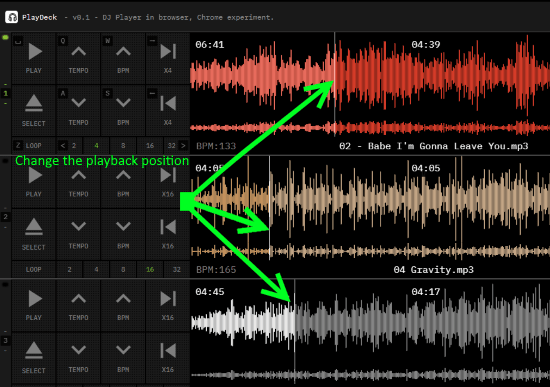 You can even mix the tracks or sync them through any point on the timeline. Also, you can use the tempo slider to decide when to silent a song from any deck. Using this online DJ player and mixer is very simple. You just have to access it from the above link and then start using it. There is no registration or sign up is required. So, just use the lower pane to search your song. After the song appears, you can push it to any deck you like. After that, you can use other controls of the player to adjust the various parameters. The volume, tempo, bass like options can be configured using the different knobs given on the top. You can even opt to play both the songs at the same time or you can opt to play them individually. These are nice online DJ players that you can use. And I really liked the way they work. The songs upload at fast speed and you can start mixing them or play them in any manner you like. If you have some basic knowledge of DJs then you will really like these tools for their simplicity and functionality. If you want to upload songs from your PC to play and mix them then use PlayDeck. And if you want to play songs from SoundCloud, then use scMixer.